This artifact is a reliquary given in honor of Pope Leo XII, who reigned from 1823-1829. It was given in 1835 to a church or chapel or oratory dedicated to Our Lady of the Snows. The exact location is not translatable in the information on the front of the reliquary. 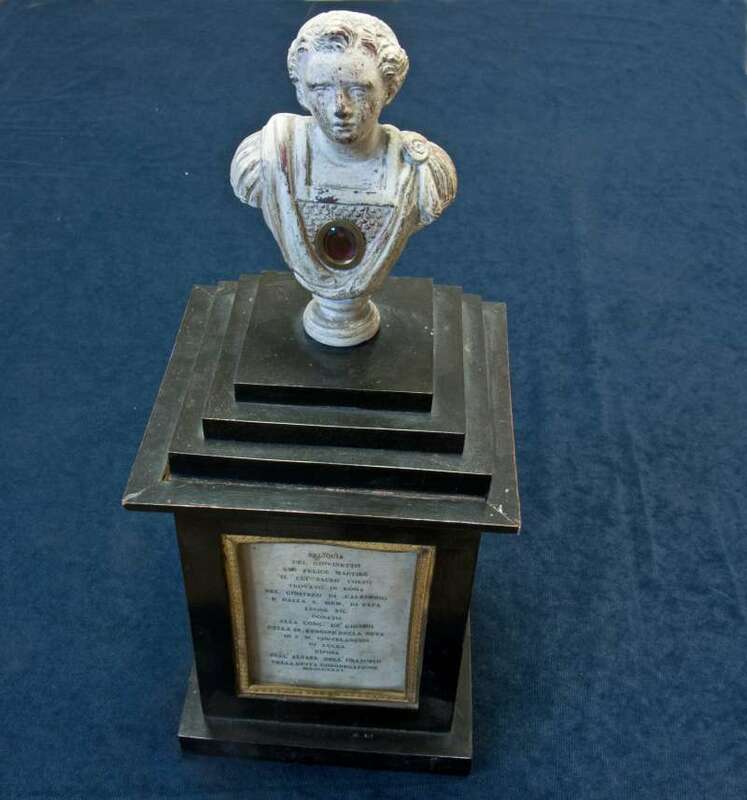 The information states that it contains a relic of San Felice, a youth who was martyred and whose sacred body was found in a cemetery in Rome, Calepodius. Although the first Pope St. Felix (269-274) was originally considered to be a martyr, creating some confusion about the actual martyr, Felice, modern scholars do not consider this to be true. The other Felix, (Felice) who was a martyr, was also buried on the Aurelian Way. Perhaps this relic belongs to that youth. It is interesting that the benefactors who donated this relic chose to present it in honor of Pope Leo XII just a few years after his death. Although Leo’s intentions were to awaken a renewed religious fervor in both the clergy and the laity, when he died in 1829, he was profoundly unpopular and unable to perceive the world around him in a manner that might have rendered him effective as a pope in the modern world. 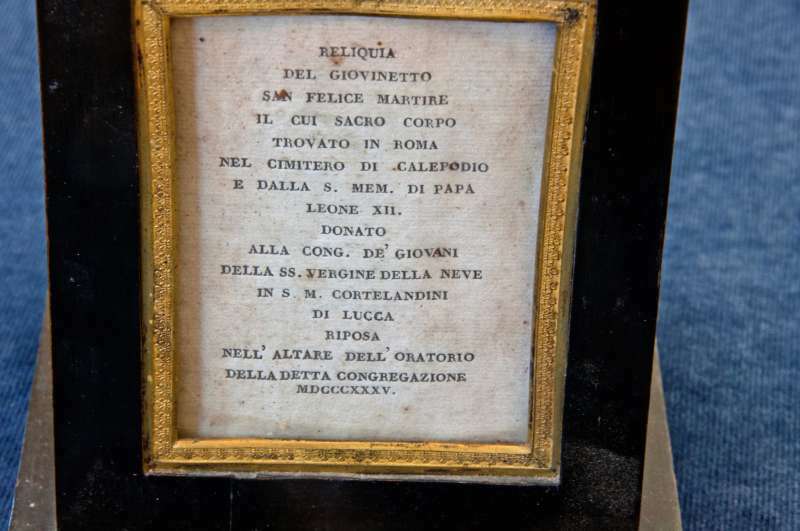 Obviously the donators of this relic were supporters of Pope Leo, and the location of this particular relic, resting near the altar of this oratory, was widely visited as a pilgrimage site. 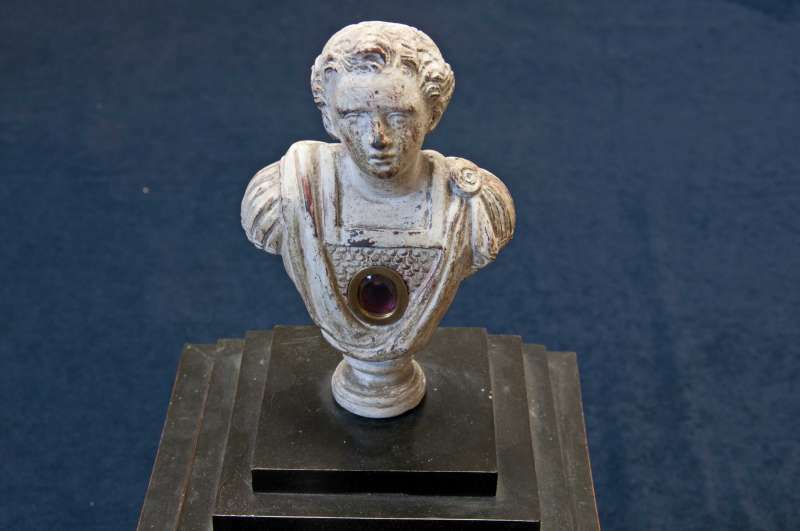 The artifact is an image of the youth, San Felice, with the relic itself located within the image. It sits on a wooden frame containing the information included here.